This adorable set of boxes features a frog parent, and its baby frog. The frogs are made of a metal alloy which is then hand-enameled in the classic Faberge style that has been popular in Russia for hundreds of years now. 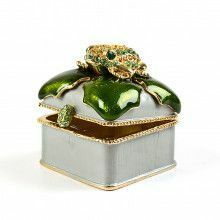 After it is enameled, each frog is decorated with Austrian crystals. These two boxes are meant to be displayed together, but they are not connected. These frogs come in a gift box, and would make a very unique decoration or present.